Will fog and sunshine repeat its half-century popularity cycle as a gray and yellow color scheme? 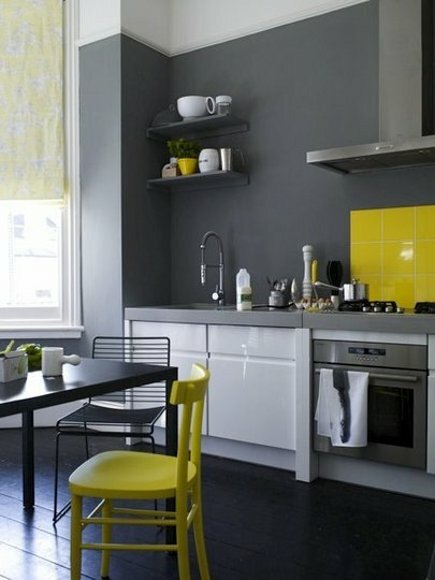 Gray and yellow was a popular color combination in the 1950s and before that in the ‘20s. Now, fifty years later it looks fresh again, particularly in slightly contemporary kitchens with sleek lines and flat surfaces. As a kitchen color, gray has gone from pallid to popular in the past few years. This week, our friends at Farrow and Ball released nine new paint colors – seven in the gray family by my count. White-kitchen-fatigue may be an explanation for the shift taking place but another is an increasing sophistication and appreciation for the subtlety of neutrals. Gray is the ultimate tone-on-tone choice and is a safe bet with white. Yellow harmonizes well while adding just enough of a satisfying bright hue. That’s my theory – the color mavens may have other explanations. 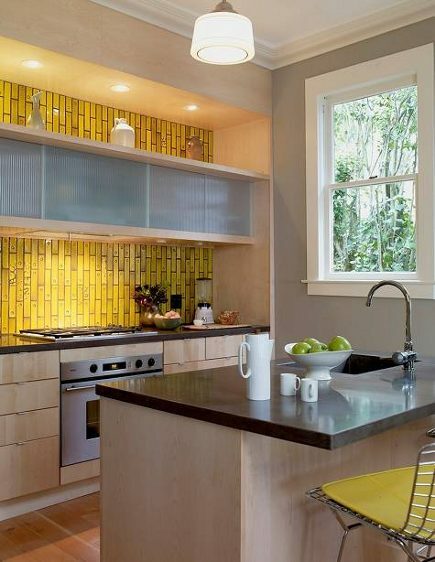 The new young owners of Heath Ceramics, a Sausalito, California manufacturer of classic tile and home goods, quite naturally used their own products in their home kitchen [top]. Robin Petravic and Catherine Bailey choose the same custom yellow embossed tile with a luxurious texture for their counter to ceiling backsplash that was used in a major installation at the University of Pennsylvania. The tiles are installed vertically in a lighted niche in the kitchen and a horizontal glass-door upper cabinet is hung over it. The top of the cabinet doubles as a display shelf. Limed-wood cabinets are strictly neutral and blend with light gray walls in what adds up to a simple but exciting kitchen space. Darker gray cranks up the drama in a modern kitchen especially with a crisp white ceiling and lacquered base cabinets. I have a special fondness for grays in this value. I also love the shift to a jolt of taxi yellow color in the ultra-simple glazed square tile range guard. Fold in a bright accent chair in the same hue for an elemental, youthful kitchen that is anything but cookie-cutter. I love the tile in the first photo! Bright, happy, makes my heart sing. I don’t know that I would like it as much horizontally, though. I think part of the appeal of that “look-at-me” backsplash is it’s vertical orientation. The deep manly grey in the second photo is the perfect foil to the shiny surfaces used in the kitchen. LOL Tricia. I should have added that my bathroom is a gray that’s similar to the kitchen color in the second photo but that didn’t sound very appetizing. I’ve been groovin’ on the gray and yellow scheme for a while. It was my inspiration when I did my kitchen in 2003. My scheme had to flow with the existing natural woodwork in an adjacent room, a historic/country setting. These versions are much more modern and fresh, which I love. What color gray is on the wall?